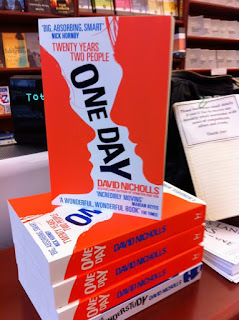 David Nicholls' latest novel, One Day, has been a huge hit both in the UK and overseas. It's a story of two people who first meet on the last day at university and then have a 'will they, won't they' -relationship for the next twenty years. The book is now being turned into a film, adapted by the author himself, and with Ann Hathaway and Jim Strugess in the lead roles. 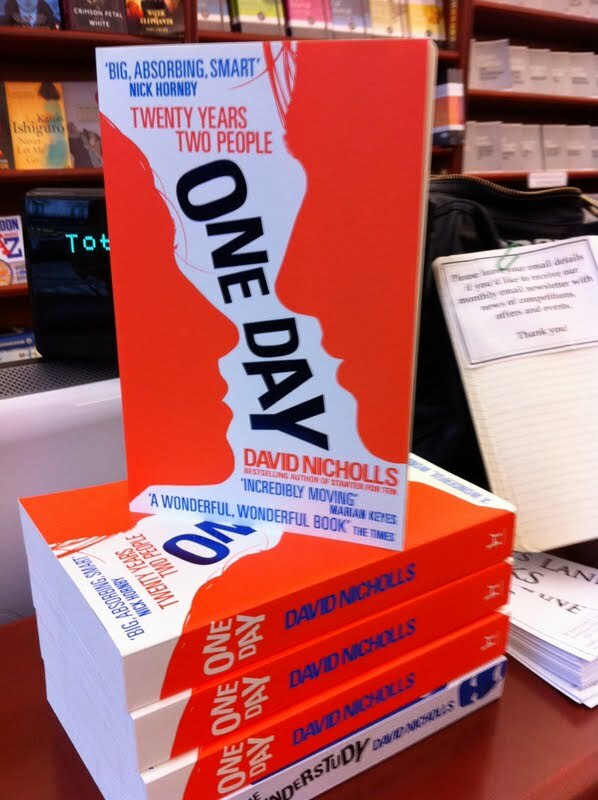 When getting the shop ready for this sell-out event, I was thinking that for some reason I always expect best-selling authors like David Nicholls to be difficult to deal with. After all, they have a great a talent and they've earned pots of money. Surely they can't be nice as well? 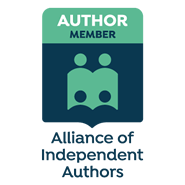 But when David walked into the shop, all smiles, looking a little shy, I was again reminded that authors, even the very successful ones, are normal people just like you and me. David was interviewed by Dan Carrier from Camden New Journal, who immediately put, not just the author, but also the audience at ease when he said how much he himself loved One Day. Dan Carrier and David Nicholls. When he asked David why he wrote a book spanning two decades, David replied that after his first two books, Starter for Ten and The Understudy, he wanted to write 'a more serious novel'. He'd adapted Hardy's Tess of the d'Urbervilles for BBC and was also working on a new adaptation of Dickens' Great Expectations. 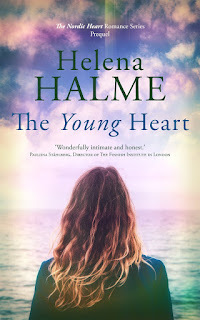 He was daunted by the task at first, especially writing from a third person point of view, but he didn't want to write another romantic comedy. It must have helped that David had the plot very well charted before he began to write – he thinks this way of planning the book beforehand is due to his scriptwriting background. As a writer, I felt relieved when he told us he didn't have any particular routine in his writing - he'd tried to wake up at five am and write for two or three hours before his young family woke up, but said he was 'too bloody tired' to get any words out. When he began to write One Day, he wanted to use the plot device of one specific day in a year when the reader would meet the main characters. He thought a lot about what day it should be, because he didn't want the day itself to shadow the plot. So a birthday, Valentine's Day or similar was out of the question. When he hit on the idea of St Swithun’s Day, he was so pleased he made it the title of the book. His publishers only convinced him One Day would be a better name a few days before the book went into print. David chatting to his fans and signing their books. When at the end of the evening, after having signed a stack of books and talked to many of his fans personally, we asked David to pose for pictures with the England's Lane Books team and he enthusiastically agreed, I felt like giving him a hug (I didn't, honestly). 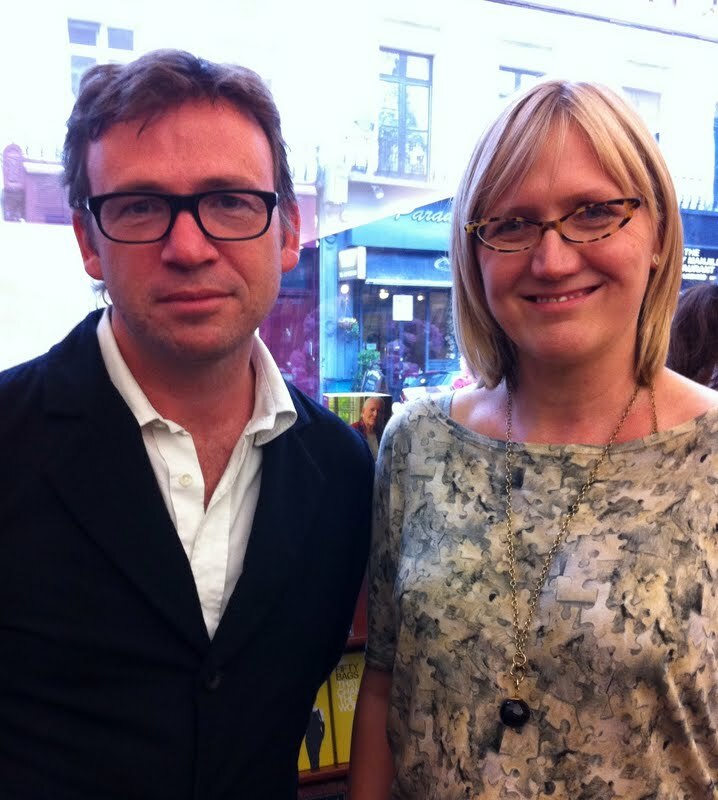 I hate pictures of myself but I just had to show you this one of me with David Nicholls. I look forward to David's next book, along with a few thousand (million?) of his other fans. PS. There's a brilliant short film about the event on the England's Lane Books web site here. Thank you:-) V. jealous (in a good way). That is such a good book - great idea, which I'd thought of it! And nice to hear that David Nicholls is a decent human being. I loved this book enormously. I loved the characters and their patter and when we get to That Bit in the book I was flicking back and forwards, mouth open like a guppy, unable to BELIEVE the twist in the story. That takes a lot of confidence and it is lovely to hear that he's actually a nice chap too. The casting of Anne Hathaway as Em in the forthcoming film seemed a bit odd, but I watched a trailer and she looks suitably gawky at the beginning. I am hoping that these author events are going well for the bookshop. Another perk to working in a very good bookshop, and not even one I'd thought of!